VroomVroomVroom can help you find the perfect car rental in San Francisco by comparing all the available vehicles from the country's leading rental car companies including Alamo, Avis, Budget, Dollar, Enterprise, Hertz and National. After comparing deals, you can directly rent the car through us. With a wide range of San Francisco car rental deals to choose from, including economy cars, SUVs and minivans, finding the ideal rental car is easy. Wide selection of vehicles: There are plenty of cars to choose from in San Francisco. We also compare RV rentals in San Francisco. Great rates: Our Price Promise assures you of getting a good deal. Convenience: Easily find the nearest depot with many locations available for pick up and drop off. You can also rent a car at San Francisco Airport​. Excellent customer service: Contact us today so our friendly customer care team can help you. We have been helping people book a rental car since 2001. San Francisco is famous for its unique summer fogs, the tasteful co-existence of Victorian and modern architecture, and its most renowned icon -- the Golden Gate Bridge. If you want to steer clear from the crowd and enjoy a warm weather, then travel to the city between September and November. Fall experiences some of the warmest temperatures in the city and there are less people traveling during that time. Spring is also a great time to visit San Francisco because of its mild temperature. Summer is the peak season so if you want to visit San Francisco during this time, make sure to book a car rental and hotel in advance. There are several events held in summer in San Francisco including the Fillmore Street Jazz Festival, Gay Pride, and California State Fair. Winter can get pretty cold in the city, but there are lots of hot hotel deals during that time. If you are planning to rent a car either in the city or at the airport, it is still best to explore San Francisco by foot to save up on costly parking fees and traffic. However, your rental car will come in handy when you drive outside the bay area. To save up on parking fees, it is best to park your car outside of town. The bay area is linked to highways 101, 80, and 880 which makes it easier to access to San Mateo, Oregon, Los Angeles, San Jose, Oakland, Sacramento, and Lake Tahoe. Before hopping in your rental car, it is also advisable to check the road conditions so you can avoid road closures and heavy traffic. For more driving tips in San Francisco, click here. Do you want to rent a car in San Francisco Airport? Most travelers arriving in San Francisco will touch down at San Francisco International Airport​. The airport is the operational base for Virgin America and it's also a hub for United Airlines. It's approximately a 13-mile trip north from the airport into San Francisco, because the airport actually sits outside the city, in San Mateo County. An SFO car rental will allow you to get into, and then to get around the city, quickly and easily. When you make a reservation through us, all you have to do is pick up your car rental once you arrive at the airport. No need to fall in line, fill up the forms, and wait for the booking to be processed. With VroomVroomVroom, you save a lot of time! Across the San Francisco Bay (and on its eastern shore) is Metropolitan Oakland International Airport, which in many instances is a lower-cost alternative to flying into San Francisco International. The drive is about 30 minutes from the Oakland Airport to the heart of San Francisco. If you are coming from the Fisherman's Wharf, it will approximately take you 50 minutes. From either airport, we recommend that you use VroomVroomVroom to compare cheap SFO car rental rates to find a vehicle that will best suit your budget and needs. San Francisco International Airport's Rental Car Center serves as a convenient location, and you can get to it utilizing the airport's AirTrain transport system. AirTrain – an elevated train – runs 24 hours a day, 7 days a week, and is wheelchair accessible. Stations for the system can be found in the terminals, terminal garages and the Rental Car Center. AirTrain's Blue Line provides service to the R.C.C. If your company is off-airport, just take AirTrain to the R.C.C. and transfer to off-airport SFO car rental shuttles, which pick up customers along the south curb of the R.C.C. San Francisco's Bay Area is home to many of the nation's most popular sights. It will tempt the fussiest of travelers with great historical sites, fantastic shopping and a culture that can't be found anywhere else. Jump into your rental car and drive on over to the piers of the San Francisco Bay. A favorite is the Fisherman's Wharf on Pier 39, where you can get a view of the famous Alcatraz Island, take a tour of the Bay, sit and watch the lazy sea lions, do a little shopping, or grab a bowl of the Bay's famous clam chowder. San Fran is a little delight, at any time or season. Your rental car allows you the freedom to sample everything that San Francisco has to offer. When you're in the mood for a great night out, getting a fantastic meal at one of the best restaurants in the entire city is only a matter of making a reservation, hopping into your car rental, and driving over to one of these magnificent places to eat. Take a road trip to discover this gem and do it cheap with a San Fran rental car. Are you in the mood for some shopping? Book a car rental with us and visit the Metreon. It's a first-of-its-kind entertainment center in the heart of downtown San Francisco. It includes a variety of restaurants, shopping venues, theaters, and entertainment destinations, including the West Coast's largest IMAX theater, making this a fun destination for all ages! Come visit the most crooked street in San Francisco! 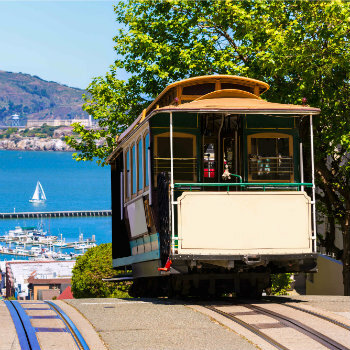 Drive your rental car over to the Hyde Street Cable Car Line which stops on the crest -- you'll get a great view of the bay from this point. The Golden Gate Bridge is an obvious destination for any trip to the Bay area. There are great views from both the north and south side of this marvel of engineering. However, most agree that the best way to see the sights is to do a walking tour of the 1.7 mile bridge. In the 19th & 20th centuries, ferry boats transported people (and later, their cars) from San Francisco's Hyde Street Pier to Sausalito on the other side; the trip costed $1 per vehicle, and took about 20 minutes. Visitors who want to attend a National Football League (NFL) game in San Francisco will actually have to drive their rental car to suburban Santa Clara (it's just northwest of San Jose). The San Francisco 49ers home games will now take place in the newly constructed Levi's Stadium at 4900 Centennial Boulevard, Santa Clara, California. With 153 rooms, the recently renovated, historic King George Hotel is a charming boutique hotel that features modern travel amenities like valet parking, complimentary Wi-Fi, and business and concierge services. Beautifully renovated rooms with contemporary décor and vintage accents offer a European-inspired ambiance anchored by exceptional service. 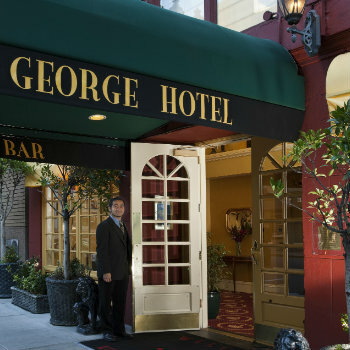 Located just one block from Union Square in Downtown San Francisco, the King George Hotel features over 500 sq. ft. of meeting and event space perfect for receptions and corporate meetings for up to 40 guests. Originally built 1914, in time for the Panama-Pacific International Exposition of 1915, the historic building is centrally located within close proximity to myriad shopping, dining, and iconic attractions. The Hotel's location offers convenient access to both San Francisco (SFO) and Oakland (OAK) airports via fast, easy public transit on BART (Bay Area Rapid Transit, Powell St. Station). Kokkari Estiatorio is one of the best fine dining restaurants in the United States as voted on Trip Advisor Traveler's Choice Awards. This popular San Francisco dining hub is the sister restaurant to world-acclaimed Evvia Estiatorio in Palo Alto, California. Their Mediterranean menu features entrees of amazing Greek and seafood dishes. A must-try in Kokkari is their classic Greek salad called Horiatiki served with Maroulosalata. Other popular dishes are their tender grilled octopus and lamb chops. If you prefer French cuisine, then make sure to visit Restaurant Gary Danko located at the iconic Fisherman's Wharf neighborhood in San Francisco. The Michelin-rated restaurant has earned many recognition for their food preparation and personalized service. Headed by world-renowned Chef Gary Danko, guests will be treated with their choice of 3 courses, 4 courses of 5 courses. It's a pricey place to eat, but it's well worth it for the outstanding service and the very memorable experience you'll have when you enjoy a meal from this highly-acclaimed restaurant. Alamo Sfo Union Square - 340 Ofarrell St, San Francisco, . Alamo San Francisco Bush St - 750 Bush St, San Francisco, . Alamo Sfo Convention Center - 687 Folsom St, San Francisco, . Avis Union Square - 675 Post Street, San Francisco, . Avis San Francisco - 821 Howard Street, San Francisco, . Avis Hyatt Regency Embarcadero - 5 Embarcadero Center, San Francisco, . Avis Fishermans Wharf - Anchorage Square - 500 Beach Street, Ste 120, San Francisco, . Budget Budget San Fran Post St. Ca. - 675 Post Street, Union Square, San Francisco, . Budget San Francisco - 821 Howard Street, San Francisco, . Budget San Francisco - 5 Embarcadero Center, Hyatt Regency Embarcadero, San Francisco, . Budget Fishermans Wharf On Beach - 500 Beach Street, Suite 120, Near Fisherman's Wharf, San Francisco, . Enterprise Civic Center - 550 Turk St, San Francisco, . Enterprise Union Square - 233 Ellis St, San Francisco, . Enterprise 1600 Mission Van Ness - 1600 Mission St, San Francisco, . Enterprise South Of Market - 312 8th St, San Francisco, . Enterprise Moscone Center - 727 Folsom St, San Francisco, . Enterprise Fisherman's Wharf - 350 Beach Street, San Francisco, . Enterprise Richmond District - 4250 Geary Blvd, San Francisco, . Dollar SAN FRANCISCO - O'FARRELL STREET, CA DLE - 364 O'FARRELL STREET, SAN FRANCISCO, . Dollar SAN FRANCISCO - SHERATON FISHERMANS WHARF, CA DLE - 2500 MASON STREET, SAN FRANCISCO, . Thrifty San Francisco - O'Farrell Street - 350 O'FARRELL STREET, SAN FRANCISCO, . Hertz Ellis Street Hle - 840 Ellis Street, San Francisco, . Hertz San Francisco-mason St - 325 Mason Street, San Francisco Dt, . Hertz Westin St. Francis Hotel - 335 Powell St, San Francisco, . Hertz Fairmont Hotel - 950 Mason St, San Francisco, . Hertz Marriott Marquis Htl - 780 Mission Street, San Francisco, . Hertz Fisherman's Wharf - 500 Beach St #121, San Francisco, . Hertz Geary Blvd. Hle - 3928 Geary Blvd., San Francisco, . National San Fran O'farrell St. - 340 Ofarrell St, San Francisco, . National San Fran Union Square - 750 Bush St, San Francisco, . National Sfo Convention Center - 687 Folsom St, San Francisco, . Feedback: Such a user friendly & helpful website. I'm impressed. Feedback: Love using your website!! so easy and affordable!! Feedback: Love you guys! We're so excited to have found a convertible at a decent price for our honeymoon - thanks!